Note: This picture does not do this dish justice! This should actually be called awesome escarole! I recently received a bundle of escarole in my organic produce delivery and wasn’t quite sure what to do with it. After doing some research I found that on the West Coast it is commonly used in salads but on the East Coast it is more commonly cooked, Utica style. You can make this recipe with lots of other cooked greens as well. Such as radicchio, kale, and chard. This was a really great way to enjoy the cooked greens and get away from just sautéing them. All the great flavors came together nicely and created a really elegant, delicious, and complex side dish. Definitely a crowd pleaser! Add the escarole and cook for 5–6 minutes until wilted. While the escarole is cooking heat the olive oil in a sauté pan over medium-high. Add the prosciutto and garlic and cook for 2–3 minutes making sure not to burn the garlic. Add the bell peppers and cook for an additional 2 minutes. Drain the escarole when it is done and add it to the sauté pan along with the chicken broth, red peppers, and salt. Gradually stir in the majority of the breadcrumbs and cheese reserving a little bit to sprinkle on top. Transfer the cooked escarole mixture to a small casserole dish and sprinkle with the remaining breadcrumbs and cheese. Finish off under the broiler for 4–5 minutes. 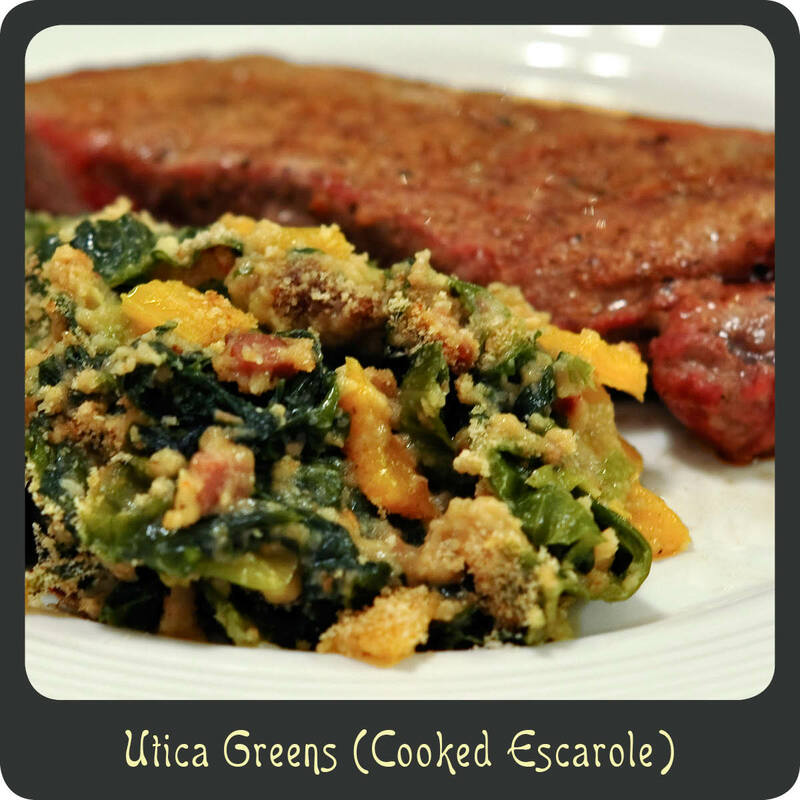 Currently living in Utica and we LOVE greens! My recipe is similar, minus the bell pepper. We don’t see that in them around here, but they do use hot cherry peppers. Also, some places make them with white beans (greens-n-beans).